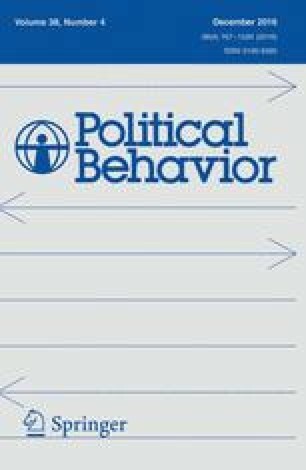 Public opinion research shows that American citizens utilize domain-specific political values to guide opinion formation in the key issue areas that comprise the American political agenda. One set of political values operates on economic welfare opinions, a different set of values applies to cultural issue positions, a third set shapes foreign policy preferences, and so on in other policy domains. Drawing on Shalom Schwartz’s theory of basic human values, this paper argues that two socially focused values—self-transcendence and conservation—guide opinion formation across all major policy domains. By contrast, the personally focused values of self-enhancement and openness-to-change should play a more limited role in preference formation. These hypotheses are tested using data from a novel 2011 national survey and the 2012 General Social Survey. The statistical results affirm expectations. We show that self-transcendence and conservation values predict scores on symbolic ideology, economic conservatism, racial conservatism, cultural conservatism, civil liberties, and foreign policy opinions. Self-enhancement and openness-to-change values play a modest role in shaping preferences. The online version of this article (doi: 10.1007/s11109-016-9344-x) contains supplementary material, which is available to authorized users. Funding for the YouGov survey was provided by an International Studies Association venture grant “Integrating Research on Domestic and Foreign Policy Opinions” awarded to William Chittick and Jason Reifler. Additional funding for the survey was provided by a University of Southern California grant to Brian Rathbun. Reifler and Scotto’s time was supported by ESRC Grant ES/L011867/1.